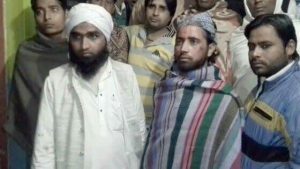 A madarasa student was attacked and was brutally beaten when he was returning to Darul uloom, Deoband from Jharkhand. Asthe train reached Sultanpur Station four men started bullying him and took his bag away. The victim ran after them but the perpetrators tore his bag and scattered his belongings. He was beaten brutally by the men.